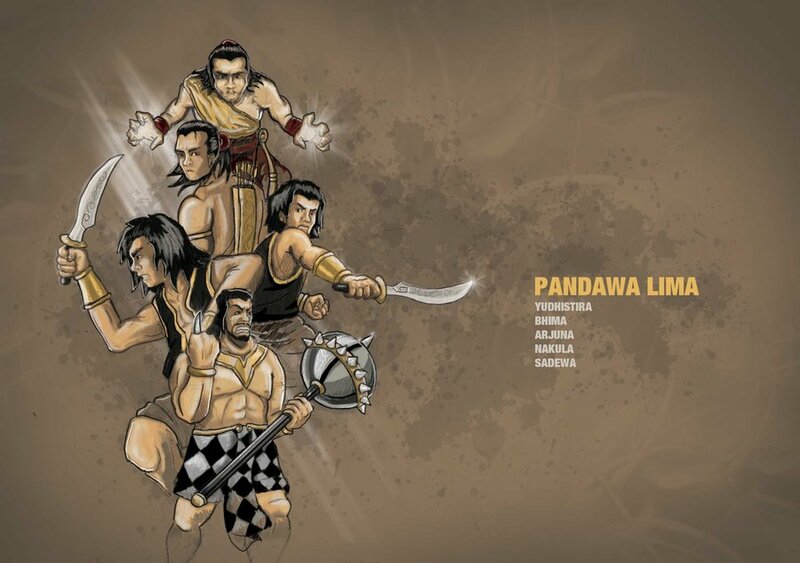 Five Pandavas always superior in the skills-made weapons and act Krida than the Kurawa. 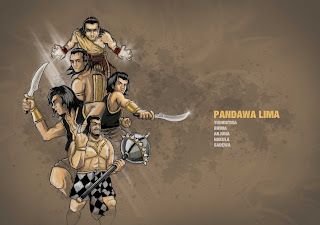 Puntadewa always superior dang financed with British literature and civics, Bima excel in the field of play mace weapons, Harjuna excel in the field of archery and swords were his tantrum Nakul and Sahadev not participate because the act is still too small. Bima big man, supposedly very ignorant rather disturbing Kurawa with no cause Kurawa often slapped and ditempeleng by Milky especially Suyudhana / Duryudhana and Dursasana (sister Suyudhana), eventually leading to a fight but always won by Bima Bima although beaten them both, because it has always been Bima impingement target of their resentment. A very greedy when Bima, the food was given poison by Kurawa, after Bima was unconscious and then thrown into wells containing Jalatunda filled with poisonous snakes ferocious. Because relief Batara Dadungnala, Bima to Bima survived and has since become immune to all kinds of toxins no matter how ferociously the toxin. Knowing his efforts to get rid of the Milky fails, then try again to get rid Kurawa Five Pandavas by burning bale Sigala-gala place to stay the Son of Pandu and Kunti's mother, but the effort and even then failed again, because the Son of Pandu obtain relief from Batara Naradha, Sang Hyang Antaboga and Yama Vidura. To prevent the Five Pandavas and the Sata Kurawa to avoid ongoing disputes, the elders they mainly Resi Bis Yama-ma and Vidura, advocated the Five Pandavas Destarastra for given forest or Wanamarta dawaprastha Kan., that suggestion was followed by Destarastra and forests provided Wanamartalah the representative. In a short time the Five Pandavas who is assisted by some god and friend saha-result, succeeded in changing the wilderness menja in a great empire by the name of Amrita and Indraprasta as its capital. The longer Amerta become increasingly ma ju, his kingdom became bigger and stronger, a lot of small kingdoms, joined the struggle thanks to Bima and Harjuna. As a statement of gratitude to Sang Hyang Widhi Wasa or Creator-gad Ja Kingdom, then the authorities entered the Kingdom of the A-marta thanksgiving, offerings to the King Suya and the Kurawapun invited to attend the ceremonial offerings to it and in the implementation of such offering ceremony there is a commotion between King Krishna with King Si Supala, ended with the death of King Si Supala, but does not interfere with the smooth course of offering ceremony. 0 Response to "The Story of Five Pandavas. Part 2"